As many of you probably have noticed, neon is back with a vengeance for S/S 2012. This tart color pallet might leave some of you with a sour taste in your mouth, given many of us were only middle-schoolers when Technicolor spandex graced us with its presence, on bodily areas that without a doubt scarred us for life. But this ain't your momma's neon ladies, these vivid hues are re-vamped and taking a punch at modern lines. For those still understandably weary of this trend, accessories are a great way to try incorporating neon, without committing to too much. 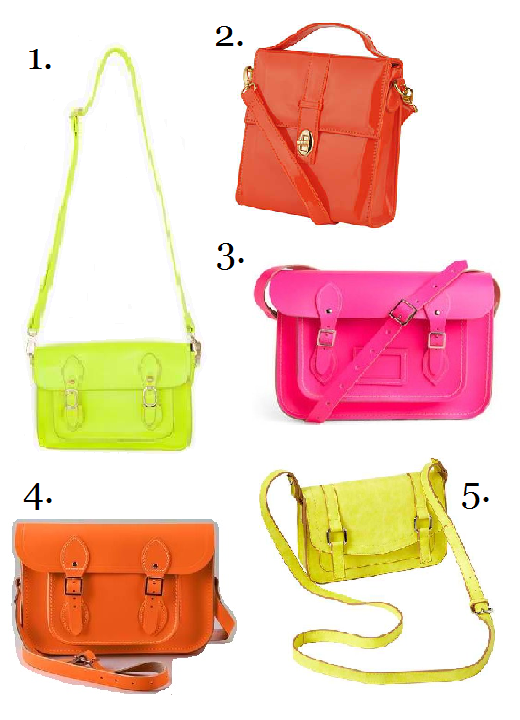 Here are some of my tangy, cross-body satchel, picks, sure to brighten any ensemble, a la 80's style.